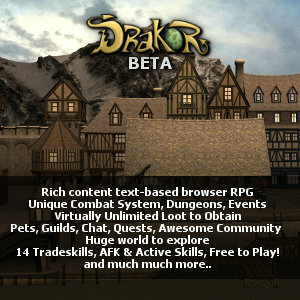 Drakor is an innovative rich content text-based Browser RPG. (PBBG, MPOG, MMORPG) It boasts a Unique Combat System, Dynamicly Generated Loot, 14 Tradeskills, Offline Play, Pets, Massive World to Explore, Guilds, Chat & more. Awesome Community, Free to Play, Mobile/Tablet Optimized (Responsive Design) and much more! Goz has come up with something totally new and fun once again. World Events! The WE will have three levels and everyone pitches in to complete all the tasks.Things are collected and created and turned in by everyone. You earn Event Points by the percentage of items you have contributed. With the EP(s) you can purchase pets, mounts, and game titles relative to the event. I chose Vanquisher of the Red Swords. Last WE some escaped Inmates got loose in Drakor and tried to get away! We stopped them with our world effort. There is a new World Event coming soon. Very addictive game. Keeps me going for a long time. Looks neat. Community is really nice and active. Game is actively updated. Best game ever played. My primary go to game. If you'll like to join go to: https://www.drakor.com/register. But if you'll like to be a referred player go to. :https://www.drakor.com/register. I just remember something. If you are going to check out Drakor use this referral link and we both get benefits as members of Drakor. I really enjoy the game because I can play on the keyboard, and away from the keyboard. Great for those afternoon naps. It's been almost two years since I landed in the land of Drakor. Awesome place. Friendly people. Lots to do. Combat system keeps you challenged. You know your addicted to Drakor when you play it 24/7! (which is highly possible with the away from keyboard (afk) activities one can pass the time with. Try it. You will not be disappointed. Simply put, unbelievably fantastic. Great community, great mechanics, great admin, great game. Definitely worth checking out for anyone. I recommend this game highly. Very friendly community, the game admin is very active and adds new interesting features frequently. The combat system is also impressive. The game is just terrific. Storage slots are limited at first but you gain more as you complete quests, something that may not be apparent if you’re just glancing at the game. The users are very quick to help out with questions, and there are guides and tutorials to really get you on your way. I recommend joining a guild. The mutual support makes the game really come alive.